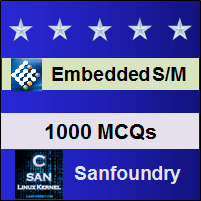 This set of Embedded Systems Multiple Choice Questions & Answers (MCQs) focuses on “Buffers”. 1. Which of these is an area for temporary memory storage? Explanation: The buffer is an area that is used to store data temporarily which can be used to compensate the timing problems. 2. Which of the following can be used as a collection point of data? Explanation: The buffer can be used as a collection point for data, that is all the important information can be collected and organised before processing. 3. Which device can compensate for the timing problems between the software? Explanation: The buffer is used to store data temporarily which can be used to compensate the timing problems between the software and it can also be used as a collection point for data, that is all the important information can be collected and organised before processing. 4. What do a buffer consist of? Explanation: The buffer consists of a pointer and memory which can be used to locate the next piece of data to be removed or accessed from the buffer. 5. Which of the following is a condition for buffer overrun? Explanation: The buffer involves two conditions. These are the buffer overrun condition and the buffer underrun condition. If the buffer cannot accept any more data, it is said to be buffer overrun. 6. What is the state of the buffer if it asked for data and cannot provide it? Explanation: The buffer is said to be overrun if the buffer cannot accept any more data and said to be underrun if it asked for data but not able to provide it. 7. Which of the following can remove data from the buffer? Explanation: The data can be removed from the buffer using a pointer. The pointer locates the next value and can move the data from the buffer and is moved to the next location by incrementing its value by the number of words or bytes. 8. How many bits does a 32-bit processor can access? Explanation: The 32-bit processor can access 32-bit word and hence the pointer is incremented by one. 9. What occurs first if data is stored in the buffer? Explanation: When the data is stored in the buffer, at first there will be a delay and the subsequent data is received from the buffer. This delay is known as buffer latency. 10. Which of the following defines the earliest information that is passed through the buffer? Explanation: The buffer latency determines the earliest information that passes through the buffer and any response to that information will be delayed by the buffer latency irrespective of how fast the processor is. 11. Which of the following possesses a problem for data streams on the real-time operating system? Explanation: The latency will be a problem for the real-time operating system such as the digital audio system which must have a consistent and regular stream of data. 12. Which of the following determines the time to take a simple sample? Explanation: The sampling is performed on a regular basis in which the filtering takes less time than the interval between the sample and this does not need a buffering and it will have very low latency. Each sample is received, processed and stored and the latency is the time take a single sample. 13. How is a stack created? Explanation: The slack is created in the same way as the buffer does, that is by using a memory and a pointer. The control associated with the buffer or memory is a register which acts as an address pointer. 14. Which of the following acts as an address pointer? Explanation: The control associated with the buffer or memory is a register which acts as an address pointer. 15. Which of the following possesses an issue while concerning the memory size of the buffer? Explanation: The digital signal processor with on-chip memory and the microcontroller possesses an issue on concerning the memory size of the buffer with small amounts of RAM. But with the large system, this is not a major issue.